There is only one issue which faces us today. Whether we will choose to remain in our fear based environment, or whether we will move to a love based environment. All else are symptoms of the fear based environment. We cannot defeat fear, because as soon as we attempt to defeat fear we have lost. Any action taken to defeat fear is a fear based action, and all fear based action generates fear, because fear feeds upon itself. However, fear is not real, fear is an illusion, and fear only exists whilst we give fear life. We must act as though fear does not exist, and in time, fear will cease to exist. Fear is an illusion, and if we do not give fear life, fear cannot exist. Fear in itself has no substance, unless we give fear substance by feeding fear. Moving Towards A Love Based Existence. A love based existence can only become our existence through choice. 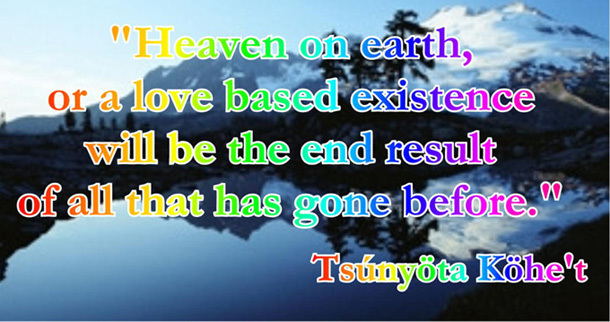 If a love based existence is not created by choice, it is not a love based existence. 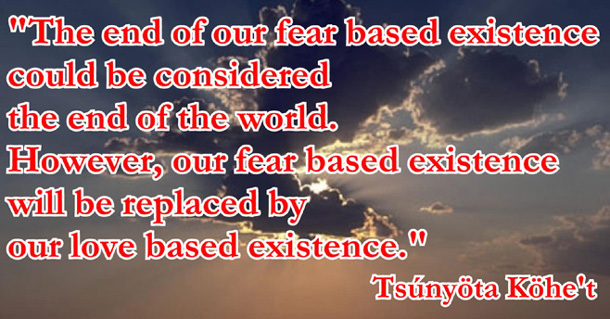 It is a fear based existence with a different agenda. No one person, no one group of people, no matter how well intentioned can change our existence from a fear based existence, to a love based existence. The change from a love based existence must be through choice of each individual. We can choose a love based existence for ourselves, but we cannot choose a love based existence for anyone else, and no one else can choose a love based existence for us. We Will Share A Love Based Existence. We will move from a fear based existence to a love based existence one step at a time, one individual at a time, until the choice of individuals becomes overwhelming. As fear feeds upon itself, so love feeds upon itself. As the love grows, so the love will grow. Love will build upon love, until love consumes all that is not love. Love Exists Within In All. Love is real. Love exists within all things, including fear. However, love is sometimes hidden by fear. Fear is an illusion. Fear does not exist beyond the earth plane. Fear does not exist within love, if fear exists within love, it is not true love, it is fear disguised as love. The key is acceptance. We must accept. Acceptance also needs understanding. Acceptance does not mean giving up on anything, or giving up on life. Acceptance is not acceptance of what those around us say and think, or where the circumstances of our lives has led us. Acceptance is acceptance of what we know in our soul to be true. This is the acceptance which we must develop. We must understand that if everybody around us says a love based environment cannot become reality, or if the circumstances which surround us seem to indicate that a love based environment cannot become reality, and we know in our soul that a love based environment can become reality, this is what we must accept. We must accept what we 'know' in our soul. When we accept what we know in our souls, we will both create and fulfil our love based environment. We always know what is in our soul, although we have to cut through fears, doubts, insecurities, negative emotions, and the expectations of others to discover the knowledge within us. We must cut through accepted theories of the artificial environment, which are continually thrust upon us, and beneath this we will reach what we know within our soul. When we reach the truth within our souls, we will know that what we find within us is reality. We must accept that the truth is within our soul. We must see the truth within our soul. We must accept the truth within our soul.